Growing need for safety vaccinations has led to surge in demand for the insulin pens and needles in the healthcare industry. Prevalence of diseases such as diabetes, HIV and hepatitis will continue to contribute towards growth of the global insulin needles pen market significantly. Increasing prevalence of diseases such as hepatitis and HIV has led to an upsurge in demand for insulin pens. According to a recent report by the CDC, 9.4% of the population in the U.S. have diabetes. Insulin pen needles will continue to gain traction attributed to various medical and technological advancements.. According to Transparency Market Research, the global insulin pen needles market is expected to represent a value of over US$ 3,800 Mn by the end of 2026. Demand for the insulin pens continue to remain high among the diabetic patients as compared to the traditional vial and syringe technique. As the insulin pens are equipped with pre-filled and replaceable needle features, preference for the insulin pens continue to remain high in the global market. Equipped with autoshield needles and the insulin pens offer greater accuracy while injecting a dose. Companies in the healthcare industry are also focusing on offering insulin pens for the visually impaired and old aged people. In order to offer convenience and clarity, the insulin pens are stamped with numbers that are comparatively larger than the ones on syringes. As these insulin pens click while administering a dose, demand for the insulin pens continue to increase in the global market. With the growing need for the insulin pens, demand for the insulin pen needles will continue to increase in the global market. A recent trend witnessed among the companies is the increasing focus on innovation and product development. Companies are focusing on developing products such as ‘Timesulin’, which is an insulin pen that enables patients to administer dosage through pumps. Timesulin is mainly developed for the patients who are Type I diabetic patients. Unlike the traditional insulin pens, timesulin allows the patients to retrieve and track information regarding the last dose taken by the patient. In order to cater to the increasing demand for safety vaccination, manufacturers are incorporating features such as replaceable needles in the insulin pens. Moreover, increasing support from the government organizations and favorable reimbursement policy is further expected to fuel growth of the global market. On the other hand, various factors continue to hinder growth of the global insulin pen needles market during the forecast period. Non-invasive techniques of monitoring the blood-sugar levels is gaining traction in the global market. Manufacturing companies are developing glucose-monitoring lens that enable the patients to monitor the blood sugar levels through the smart contact lenses and transmit the retrieved information to their phones. As these devices do not require needles, demand for the insulin pen needles will continue to witness a drop. Bound to these factors, the global insulin pen needles is expected to witness an inhibiting growth in the global market. With the growing preference for cost-effective insulin pens, demand for the standard insulin pens and needles will continue to remain high in the global market. On the basis of product type, the standard insulin pens and needles segment is expected to generate significant revenues, accounting for a value of over US$ 1,000 Mn by the end of 2026. However, the safety-engineered insulin pen needles product type segment is expected to register the highest CAGR throughout forecast period. Based on distribution channel, the hospital pharmacies segment is expected to represent the highest revenue growth, recording a value of over US$ 200 Mn by the end of 2017. On the other hand, the online sales distribution channel segment is expected to register a robust CAGR through 2026. By application type, the type II diabetes segment is expected to witness a robust growth in terms of revenue, accounting for a value of over US$ 1,000 Mn by the end of 2026. On the contrary, the type I diabetes application type segment is expected to register a healthy CAGR during the forecast period. Leading market players operating in the global insulin pen needles market include Becton, Dickinson and Company, Novo Nordisk Inc., Owen Mumford Ltd., VOGT MEDICAL, Perrigo Diabetes Care, MedExel Co., Ltd. and HTL-STREFA S.A. The global insulin pen needles market is expected to witness robust growth attributed to increasing prevalence of various diseases such as diabetes, HIV and hepatitis. In addition, increasing support from the government organization will continue to rev up demand of the insulin pen needles globally. As these medical devices are equipped with replaceable features, sales of the insulin pen needles will continue to remain high in the global market. Manufacturing companies are also increasingly focusing towards development of innovative medical devices that offers convenience and safety to the customers globally. However, increasing focus on development of the non-invasive medical devices is likely to inhibit sales of the insulin pen needles in the global market. The report offers in-depth insights on the crucial aspects of the global insulin pen needles market and provides information regarding the growth factors, important segments, competitive landscape and factors propelling market growth. Growth of the global insulin pen needles market is significantly bound by various macro-economic and micro-economic factors. The report highlights that the global insulin pen needles market is increasingly driven by increasing prevalence of various diseases such as diabetes, HIV and hepatitis. Attributed to advanced features such as pre-filled pens, replaceable needles and autoshield needles demand for the insulin pen needles will continue to increase during the forecast period. Moreover, manufacturing companies are increasingly focusing on developing medical devices that are equipped with non-invasive features. Recently manufacturing companies concentrating on developing various medical devices such as ‘Timesulin’ that enable the patients to inject dosages through pumps. Further, timesulin is increasingly equipped with enhanced features that retrieve and track information regarding the amount and time of dosage taken. This medical device is mainly developed for the type I diabetic patients. With the growing demand for safe dosage administration, manufacturers are mainly concentrating on developing insulin pens that are incorporated with the replaceable features such as needles. Favorable reimbursement policies and increasing government support will continue to impact growth of the global insulin pen needles market during the forecast period. On the other hand, several factors are expected to inhibit growth of the global insulin pen needles market. Surge in demand for the non-invasive medical devices is likely to dip the sales of the insulin pen needles globally. Further, manufacturing companies are increasingly concentrating on developing medical devices such as the glucose-monitoring lens that enable the patients to track information related to the blood-sugar levels and transfer the information to the phone through the smart contact lenses. 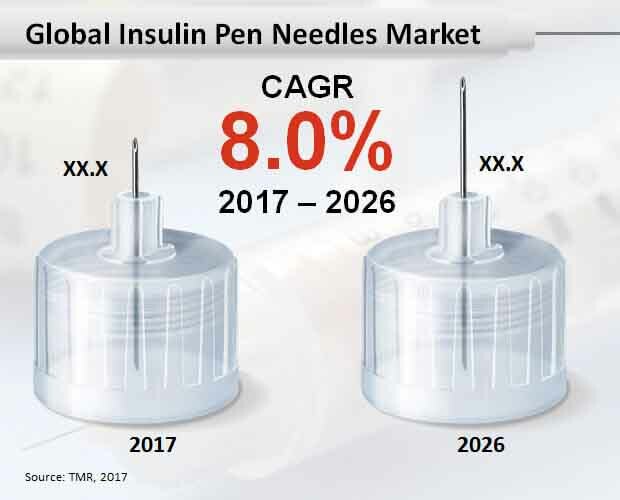 Increasing demand for non-invasive medical devices will continue to dip the sales of the insulin pen needles globally. The global insulin pen needles market is segmented on the basis of product type, distribution channel and application type. Based on product type, the global market is expected to be segmented as standard insulin pen needles and safety-engineered insulin pen needles. Based on distribution channel, the global market is segmented into hospital pharmacies, retail pharmacies and drug stores, online sales and diabetes clinics/centers. By application type, the global market is segmented into type I diabetes and type II diabetes. Key players in the global insulin pen needles market are MedExel Co., Ltd., Owen Mumford Ltd Perrigo Diabetes Care, HTL-STREFA S.A, Becton, Dickinson and Company, Novo Nordisk Inc. and VOGT MEDICAL.